Over the years we've chronicled the epic transformation of Marie Osmond's face. Dating back to almost a decade ago when she was first rumored to have undergone plastic surgery for a facelift, later a brow lift, and then eventually enough botox to tighten up the face of a Shar Pei. And while these before mentioned procedures seem like enough to satisfy even the most vanity stricken celebrity, its now being reported that Marie Osmond has yet again sought enhancement by way of plastic surgery. Over the weekend Marie Osmond served as the Grand Marshal at the 80th Anniversary Hollywood Christmas Parade. It was during this appearance when she unveiled her new "look" that got everyone speculating... about plastic surgery. Just a quick look at these before and after pics and you'll notice a tremendous change in her appearance. And in our opinion it looks to be the result of at least three procedures, all of which are presumed to be non-surgical. Firstly, her upper lip is quite obviously inflated with either collagen or perhaps Juvederm injections. Secondly, we see an indication of 'frozen brow' which is often caused by botox injections. And thirdly, Ms. Osmond's face appears more full or "filled out" than usual, which could indicate the use of facial fillers. 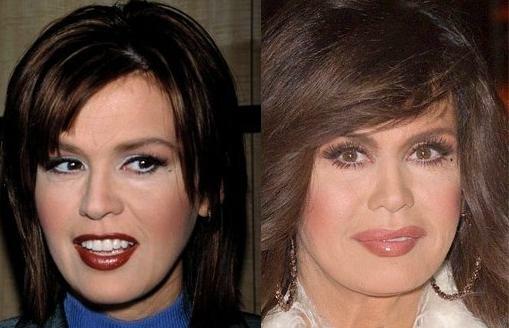 Well folks, how would you rate the results of Marie Osmond's presumed plastic surgery makeover/under? Vast improvement or just plain scary? The most mind boggling aspect of this entire cosmetic scenario is... Marie Osmond was exceptionally beautiful as an all natural woman! Maybe she simply needed a new mirror. Instead she slowly drifted into the redundant role of Hollywood's favorite story 'Plastic Surgery Horror Stories'. We cherish youth more than we do wisdom. Will I do it? I'm sure. Nobody wants to have a saggy jowl. Is it bad to do? I don't think anything is bad if it makes you feel better. awful awful and she's had something done to her beautiful teeth too. yUK! Oh my gosh Marie! I'd have never believed it. What is it that you feel you're missing? This just goes to show that, you can never tell what's inside a package by looking at the wrapping! I am beside myself. Speechless! When I was a child I used to think you were the most beautiful woman. I still thought you were beautiful to this day but OMG, I can't believe what you did. I will never make that irreversible mistake. Absolutely disgusting!!! She actually looks frightening and ugly to boot. She obviously can not stop herself (another Joan Rivers)... but it is clear that this woman has so many issues and always has. Too bad the poor thing took it out on her face. That was the one thing that was natural and beautiful in her dysfunctional life. This woman has gone too far and just looks like an old, tired hag. Isn't plastic surgery great!! I am so, so surprised. I thought her religion forbid things like plastic surgery!? Isn't there a whole 'vanity' sermon? What is she thinking?? She was absolutely naturally beautiful. Why would you want to mess with natural beauty. Another Joan Rivers wanna be?? You were so beautiful before, now you look like a freak. What were you thinking? This is absolutely pitiful. Why would someone do this to herself? She was so pretty and now she is just plain ugly and hard to look at. Very sad in my opinion that someone would go to these lengths to look better or younger and end up looking like a clown. Awful!! well, just goes to show you how all that "religous" dribble etc. out of her mouth does not mean much. She has always had bigtime issues and is trying to compensate for her low self esteem with thinking she makes herself beautiful by using this crap in her face. And she has done the complete opposite: She now looks like a clown and is ugly. These poor Hollywood creatures. Being Mormon has made her insane. Oh come on, she doesn't look that bad. Yes, she's had work and in 2003 she had some serious BAD work done that was quickly reversed. Yes, she has major issues about her looks which happens with alot of people in the limelight and she wears WAY too much make up but she's still pretty. I just hope she doesn't go any further. Sorry folks I have always like Marie and still do but she had such a beautiful natural looking face so pretty and now she looks like she was in an accident and this is the best they could do to repair her. I am so sorry she has done this to herself and if she really takes the time to look at what she has done I bet she wishes she could reverse the surgeries herself. She has obviously had a rhinoplasty as well. I sure it was not for medical reason...like a broken nose.....She was able to sing beautifully with the previous nose, why change it? I had a rhinoplasty because I had a deviated septum, which is a valid reason to have one, but....why change what is not broke? I hope she realizes someday that it is our happiness on the inside that counts. ALL OF YOU NAYSAYERS ARE FULL OF CRAP. MARIE IS JUST AS GORGEOS AS EVER. YOU ARE LOOKING AT PICTURES FROM A TEENAGER TO A 53 YEAR OLD WOMAN. IF YOU DON'T THINK AGE CHANGES YOUR APPEARENCE, THEN TAKE A GOOD LOOK IN THE MIRROR. ESPECIALLY YOU JERKS THAT HAVE AGED RIGHT ALONG WITH THE REST OF US. HOW GREAT DO YOU LOOK, COMPARED WITH YOUR TEENAGE PHOTOS? HAVE YOU NOTHING BETTER TO DO THEN PEDEL BS ABOUT A BEAUTIFUL PERSON? GROW UP,AND GET A LIFE. I am with you. I just saw her on an ad and she looks great. She is the best looking fifty five year old lady on TV.